The museum of London is as the name suggests, a museum covering Britain's capital city's long and turbulent history right back to prehistoric times. It is situated right next to the remains of the old roman city wall, which can be seen through a viewing window from within the museum. The museum has just recently gone through a major re-designed and all the galleries were fully opened to the public during 2010. I must say that i found the recent changes within the museum very welcome as I used to find this museum rather stuffy and a little uncomfortable to explore. Now it is vibrant, spacious and is so much better organised, it really is a joy to visit. There is so much to see at the museum of London that I would suggest either an early start or to break the visit up to two separate visits. It can be rather exhausting to try and see the whole museum in one go but it is possible, but be prepared to take lots of breaks. 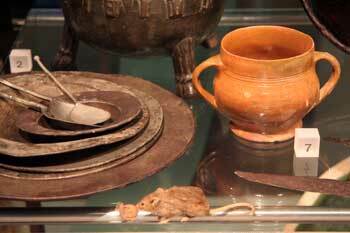 There are separate gallery spaces in the museum of London which cover different periods of time in London's history. Below you will find a snap shot of each gallery, each with a click through to more pictures and information about each. Hope you enjoy them all. 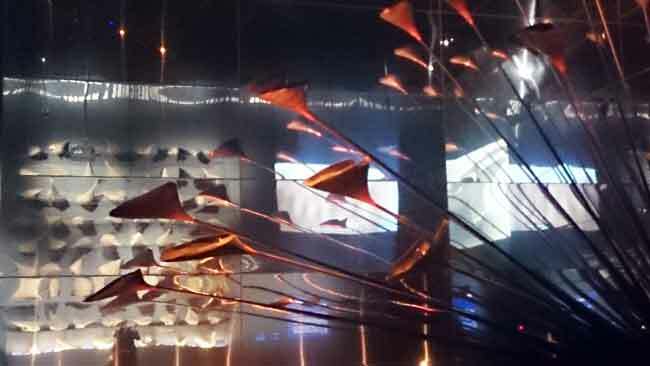 One of the newest gallery spaces holds a replica of the wonderful imaginative Olympic cauldron designed by Thomas Heatherwick. Read my review of the exhibition and see a fantastic video of my experience. This gallery shows how the London area looked before there was any major settlements in the area around 450,000Bc right up to the time the Romans arrived around 50AD. There are plenty of animal skeletons and bones to be see as well as many of the prehistoric tools used by the early humans in the area. The area was mainly wilderness and home to just a handful of humans. One of the most intriguing items in the gallery is a reconstructed head of a woman's skull which is around 5640 years old, it gives a fascinating insight into how the people from this prehistoric age may have looked. More Information about the London before London Gallery. This gallery covers the period between 410 to 1558 AD and depicts the growth of London between the arrival of the Anglo-Saxons to the early years of the Tudors which was about a 100 years in duration. There is a wide variety of items all very different in style due the large time span, so for instance you can see a gold and garnet brooch from the mid 600s to some extremely pointed shoes from the 1380s. 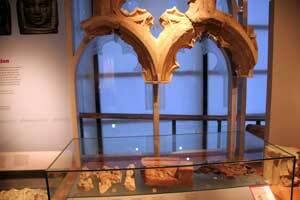 More about the medieval London Gallery. Moving on to the Roman gallery in the museum of London you will be taken through a reconstruction of some Roman rooms and shops as well as lots of items recovered such as statues and even a leather Roman bikini. The Roman's were the first to built the first major city settlement in this area which was known as Londinium. They built roads and fortress walls to protect the city. The Roman's settled in Britain for over 350 years and as such played a major role in shaping the country and strengthening its wealth and power and as such this area of the museum takes up one of the largest exhibition spaces to display the many objects found in London. More information about the Roman London Gallery. This gallery in the museum of London covers the period between 1550s-1660s. A time of extreme turmoil and destruction within the city. The great fire of London is commemorated here via a very exciting animated display which should not be missed (it is tucked away in its own little room so keep an eye out for it). Also the Great Plague of 1665 is also rather dramatically explained here and illustrates just how badly affected the population of the city were. More about this gallery including the Fire of London. These three galleries are on the upper level and some of the newest areas within the museum of London. Personally they were my favourite areas possibly due to the fact that I could relate to many of the items on display. Fashions, politics, technology and city growth can all be found in these galleries. These galleries are the most up to date and interactive which does make them very popular with school trips etc so do expect some crowds. The Victorian street area can also be found in these galleries and are put together so well that you really do feel as if you are wandering around real shops. If you are of a certain age you may even discover items that you remember from your own childhood. This gallery has been specially constructed to house the magnificent Lord Mayor of London's Gold Stage coach which dominated the centre of the gallery. Many of the ceremonial robes associated with the lord mayor of London and the city's ancient traditions. More about the City Gallery. This area is a large open space in the centre of the museum of London. The area provides a seating area for hot and cold drinks and light snacks to be bought and eaten. I found this area very welcome as it allowed you to take a break as you went round the galleries, I think I stopped here at least twice during my visit. Above the seating area you will discover a huge LED display which loops around the gallery and plasma screens which represents London life today. 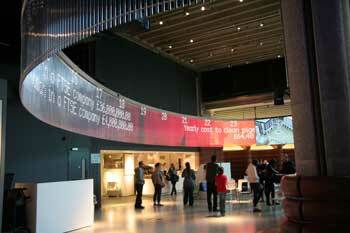 It is extremely engaging and you can spend quite some time viewing the screens and deciphering the LED display. Computers can also be found in this area which allows you to explore items from within the museum in more detail. 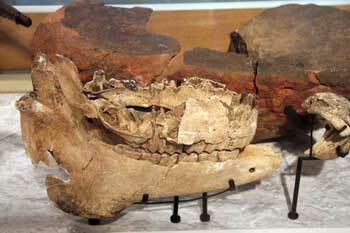 The skull of an extinct auroch, 245,000-186,000BC. - An auroch is the name for a wild ox and this skull is particularly impressive and is the first thing you will see as you enter the "London before London" gallery on the ground floor. Marble head of Mithras - This imposing head once stood in a Roman temple in the City of London. Late 15th century altar paintings - these two painted panels are thought to have come from one of the smaller chapels within Westminster Abbey. A Saxon brooch - this brooch is about 1400 years old and was discovered in a grave in the Covent Garden area of London. The Great Fire Experience - this model has been at the museum for many, many years and I remember seeing it myself over 20 years ago when i was a child. However it has been brought up to date and is still as captivating as it always was. Sit in the dark and witness the great fire take hold and destroy a large area of London. The Lord Mayor's State Coach - This stunning gold coach was built in 1757 and has now been moved to its own gallery area giving it pride of place in the city gallery on the ground floor. 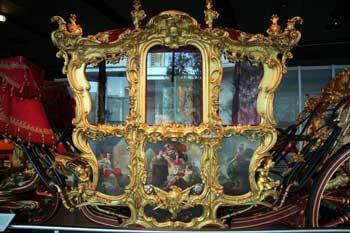 This coach has also been at the museum for many years but it has never looked so good as does today. The Fanshawe dress - This is an amazing dress which was made from silk which was spun by French Huguenots in the spitalfields area of London during the 18th century. The dress was made for the daughter of the Lord Mayor of the time. 18th century Pleasure Gardens - A new space which is like an enchanted garden to explore. 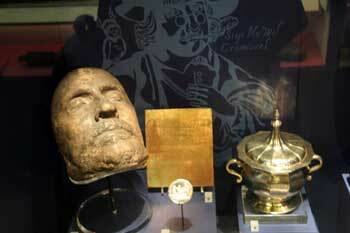 It contains a display wonderful period costumes and commissioned masks and hats by Philip Treacy. The Victorian Walk - This area is constructed like real life Victorian streets. you will see the local pub, the barber, the cake shop and the tailors amongst many other period shops of the time. The 1960's Scooter - experience clothes and other items from the swinging sixties including a Beatles dress. Have you visited the Museum Of London? 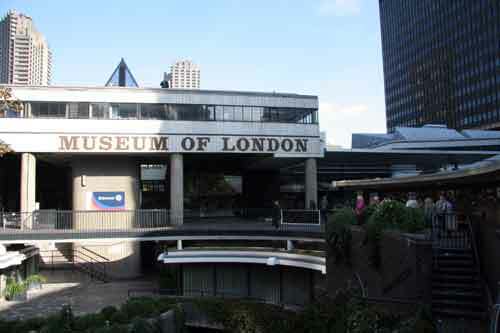 Why not share your own visit to the museum of London and gives us your own review of your visit. Did you like it? Or did you find it all too much. 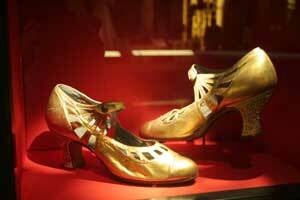 Whatever you want to say about the museum to help inform other visitors is welcome. Please use the form below.